This week’s post offer one way to handle end-of-quarter grades in a classroom that functions without grades. Tuesday’s post discussed the portfolio template and how to set everything up. Wednesday’s post handled reflective analogies. 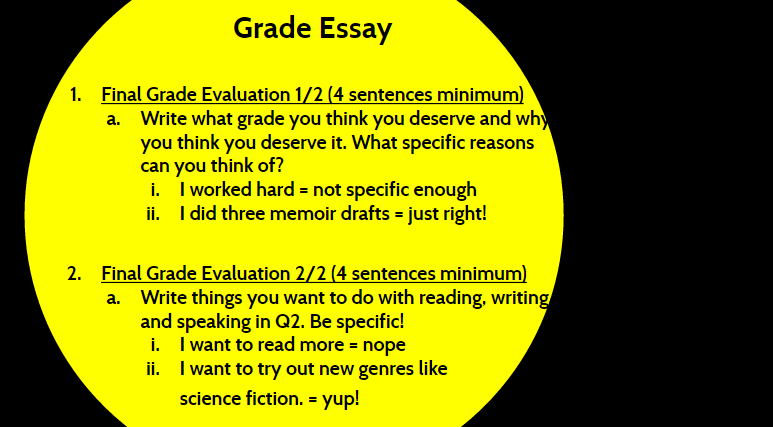 Today’s post deals with the final component of the portfolio: the grade evaluation essay. As I said earlier, I removed grades, quizzes, and tests from my classroom three quarters ago. The end-of-quarter grade my district requires is the only time I have to input something into the electronic gradebook. Here’s the Google Slide presentation. After getting settled in with the warm-up, students discuss what an A, B, and C look like and sound like in our English class. At first the students stick to superficial ideas: sitting up, paying attention, completing every assignment, etc. They’ve internalized the language of what’s expected of them (essentially obedience) over years of repetition. I have to push them to move beyond the surface, to focus on our English class specifically. 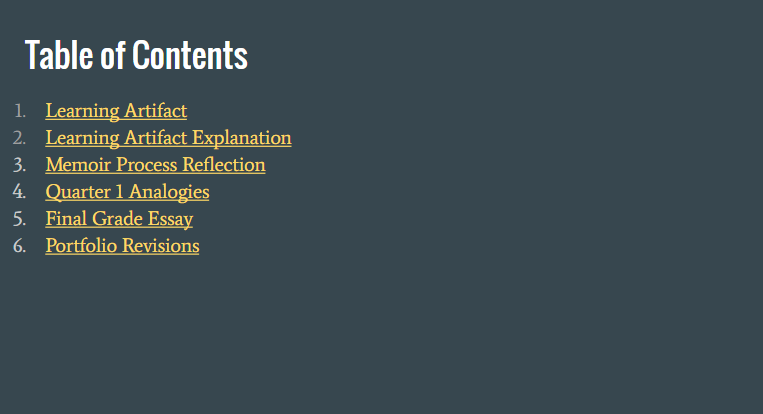 I list all of the different types of assignments and discussions we’ve had over the nine weeks. This is hard. After each group has cobbled together a decent enough list, they write their findings on big pieces of chart paper around the room. There are six total: “An A looks like,” “An A sounds like,” etc. Then I tell them it’s time they compose their two paragraph grade evaluation. The paragraphs go into their Q1 Portfolio Google Slide presentations. The first slide is essentially “what grade do you deserve and why?” The second slide asks students to come up with a wishlist for quarter two and write me a personal note about how everything went. You’ll see I reiterate the need for specificity by including two simple “Do this/not that!” examples on the slide. After spending the next day polishing up their drafts, students are done. I meet with each of them over a four days to hear them summarize their portfolio work and pontificate on next steps. If I agree with their grade (which I do 99% of the time), I immediately put it into the grade book. Students aren’t used to this. Or, at least, the students I teach aren’t. It requires of them (and you) a pretty big leap of faith. You’re asking them to flip on circuits long rendered dormant by external systems of punishment and reward. Some of them discuss feeling guilty. They don’t know how to balance their desire for honesty with the contingencies of parents, family members, honor rolls, etc. This post, however, isn’t the place for a deeper discussion into assessment ethics and professional judgement. Hopefully you found something to add to your own practice or at least to think about. Thanks for reading! Yesterday’s post dealt with how I used Google Classroom and a Google Slide template to help students get started on their quarter one portfolio. It also discussed how students selected a piece of work and analyzed it for the first part of their portfolio. 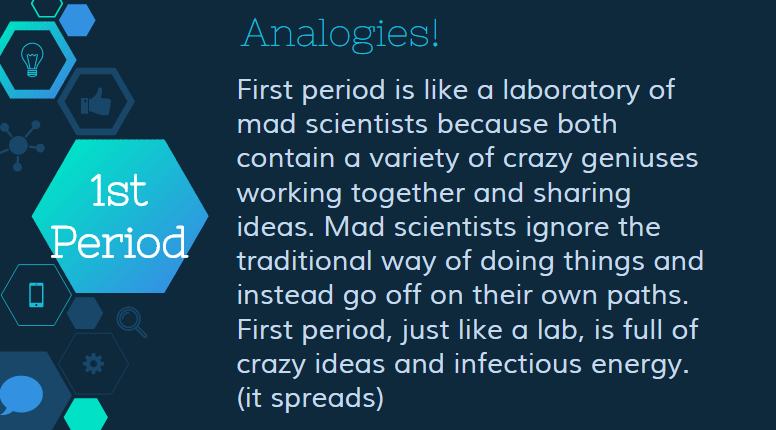 Today’s post explains the next stage in our portfolio process: analogies. First up: here’s the day’s presentation. As before it contains the entire lesson, not just the portion discussed in this post. So I started the lesson out by introducing students to an analogy of my own. I briefly discussed how I wanted them to find common ground between two different objects. I wrote a different analogy for each period. Here’s first period’s. Next up it was time for students to take a crack at it. I walked them through the process step by step. 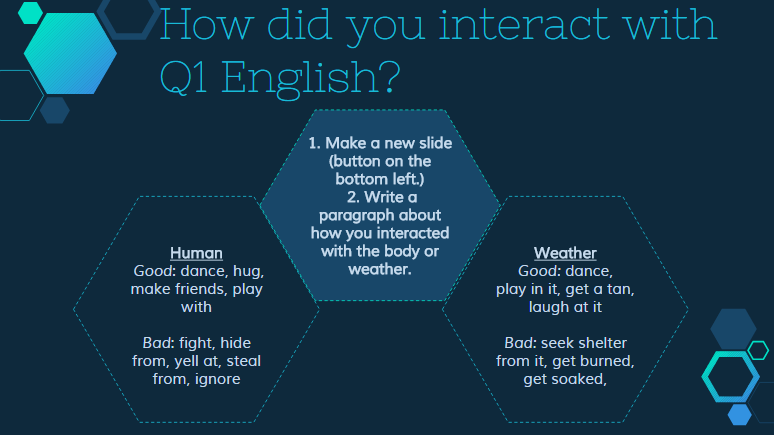 Vigilant readers might have noticed yesterday’s Q1 Portfolio Template contained two slides mysteriously titled: Q1 English is a Human Body and Q1 English is the Weather. For the first round of analogies I decided to limit students to using one of those two options. I’ll open it up next quarter. Here’s a quick summary of the process. Choose the human body or weather analogy. List four appropriate parts of either the weather or the body. List at least five things that each of those parts does. For instance human hands open, wave, shake, pinch, and catch. In what ways did Q1 English open, wave, shake, pinch, and/or catch? It’s a lot on one slide, but I tried to include only the most necessary words and examples. That way I could leave it up while I went around and worked with individual students. Once students got over the “this is weird” hurdle, they started cranking out some interesting connections. After students wrote their paragraphs it was time to take the abstraction up a notch: how did you interact with Q1 English? I wanted them to stick with their analogies, so I modeled my own. 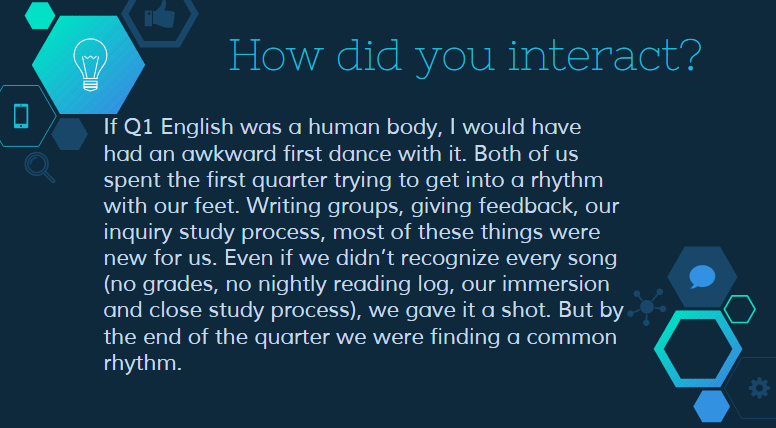 I imagined Q1 English as a human body that I danced with. Since it was the first quarter the dance was awkward. New routines, new students, and new expectations meant a lot of miscues and stepped-on toes. 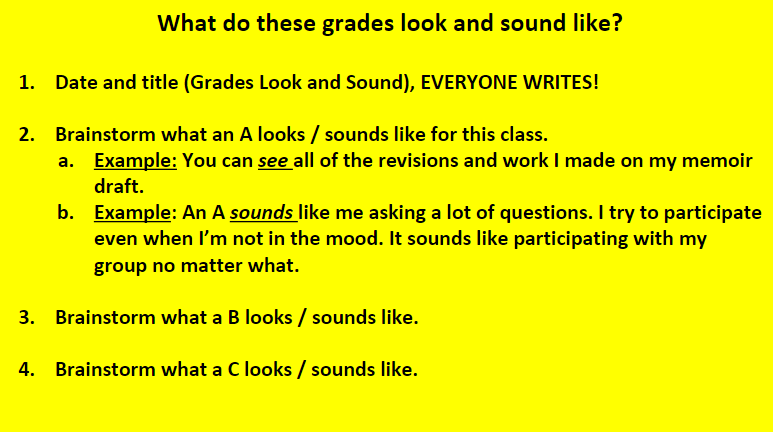 I knew students would need help with this process, so I created a slide to give them a way begin. Regardless of how students felt about Q1 English, I provided options for getting started with both the human and the weather analogy. Chose the weather analogy and hated the class? Then you might say you sought shelter from the storm. You stayed inside and watched TV while Q1 English pelted the windows trying to get in. 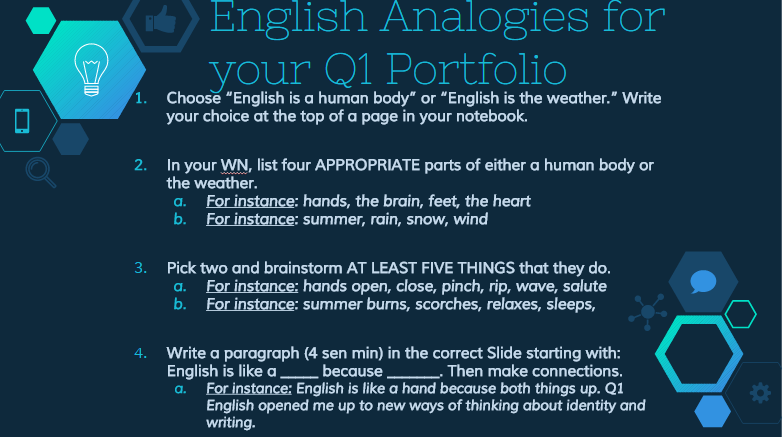 Or maybe you chose the human analogy and loved Q1 English. In that case maybe you two became fast friends, learning about each other’s quirks and getting outside your comfort zone. Students typed up their paragraphs onto the corresponding slides in their Q1 English portfolio template. Students enjoyed the lesson, even though some of them remained somewhat confused by the slightly unorthodox approach. 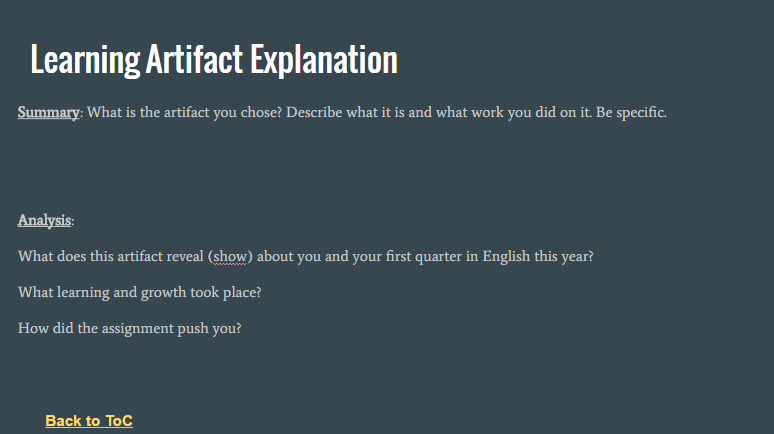 Tomorrow I’ll talk about the culmination of the portfolio: the grade reflection component. Although I don’t use grades, my district requires at least one grade for each marking period. I use the summative grade reflective essay to help students make sense of what they’ve done in my class during the last nine weeks.